Established in 1974, School of Electrical Engineering has cultivated a person to be competent and suited to the field of electrical engineering which is the key industry in Korea. 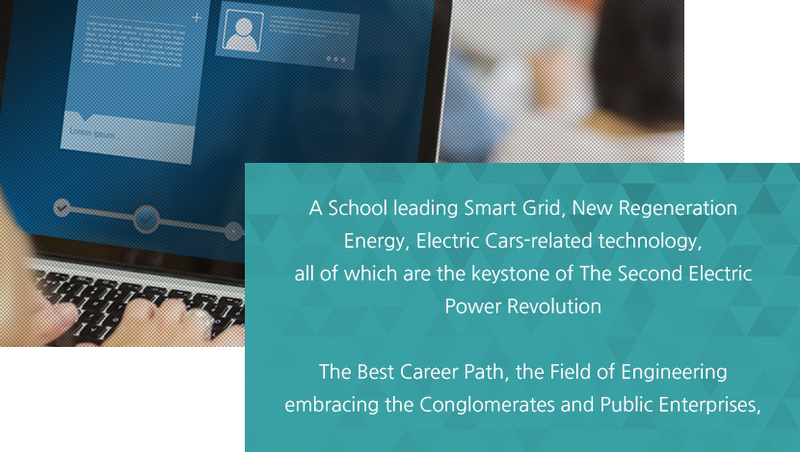 Leading the smart grid, new regeneration energy and electric cars-related technology, all of which have become the most important keystone of the second electric power revolution in 130 years after Edison, the department has had a curriculum of electrical engineering + IT technology + software convergence, including advanced new technological fields. Specifically, the curriculum covers the detailed fields such as electrical material & high voltage, power electronics, digital signal processing, semiconductor device & integrated circuit, electric machinery, electric power system/Energy system, plasma applications, signal & image processing and digital engineering & Control engineering. School of Electrical Engineering has carried out diverse programs of supporting students (scholarship & connection with industry) by implementing efficient curriculum for operating education system through continuous performance of and participation in national manpower cultivation projects such as Government-led Engineering College Supporting Project(5 years starting from 1995), BK21 Project(5 years starting from 2000), KEPCO Basic Manpower Cultivation Project(2 years starting from 2003), New University for Regional Innovation (NURI) Project (5 years starting from 2004), Electric Power IT Manpower Cultivation Project(4 years starting from 2000) and Smart Grid Basic Manpower Cultivation Project(4 years starting from 2010). The Electrical Engineering Department in Chungbuk National University has the education and research system on the basis of fields of nation’s traditional key industries and various advanced applications.